Walsall assistant manager Richard O'Kelly says that finally reaching Wembley with the Saddlers, after missing out as a player, is his finest moment in football. O'Kelly, 58, was in the Walsall team beaten in the 1984 League Cup semi-finals by eventual winners Liverpool. But he insists their Johnstone's Paint Trophy northern area final win over Preston more than makes up for it. "It's dreamland. Best-ever achievement in football," he told BBC WM 95.6. "I would loved to have got there as a player - but Liverpool in those days were a bit tough." O'Kelly has been to Wembley only once before, as number two to Sean O'Driscoll when Doncaster Rovers beat Gary McAllister's Leeds United in the 2008 League One play-off final. But he says being part of Dean Smith's class of 2015 outranks that result. "We also got to the JPT final the year before with Doncaster, although it was played at Cardiff then. But, at Donny, we had a lot of money then compared to other teams. West Bromwich-born O'Kelly was signed by Alan Buckley for Walsall as a 22-year-old from non-league Alvechurch in 1979, and scored 56 goals in 204 league games over seven seasons for the Saddlers. After leaving for Port Vale in 1986, he returned on a free transfer 18 months later before rejoining Buckley at Grimsby, where his playing career was ended by injury in 1989. He then worked at Vale and Grimsby before following Buckley to West Bromwich Albion as youth-team coach in 1994. He joined Hereford United as Graham Turner's number two before linking up with Sean O'Driscoll, first at Bournemouth, then at Doncaster Rovers. After being brought back to Walsall by the newly appointed Dean Smith in 2011, he briefly left to take on the manager's job back at Hereford in March 2012, only to return following the Bulls' relegation from the Football League. "With the budget we have here at Walsall, this is an incredible achievement. "I very rarely get emotional, but I was a little choked up at the end about what it means for the club and for the manager." 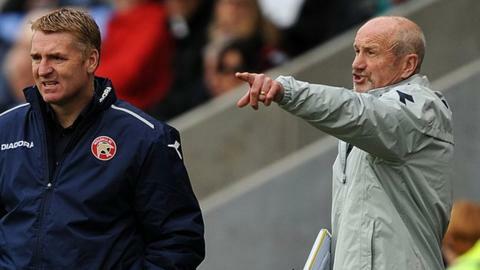 Smith has only been Walsall boss for four years, but is English professional football's fourth longest-serving manager. "He's not been in the job long in some ways. But I read somewhere the other day that success comes not through doing well every now and again, but through consistency. "It's about having a plan and sticking to it, even if you've had your potholes along the way. "Dean never gets up and never gets down. He's got a plan and he tries to stick to it. This club has a tradition of playing football a certain way."